…a Penobscot Indian born the year before America declared its independence. […] The Penobscots said Molly Molasses had powers, m’teoulin, given by the Great Spirit. People with those powers, her dad told her, could interpret what dreams meant, cure diseases, and tell hunters where to find game. It’s too bad Molly didn’t wind up with any of those powers herself. Kline's story is set in Maine. Molly spent her early years living on the reservation on Indian Island with her dad, who was Penobscot, and her mom (her identity is not specified, which means, she's white. You know--the default is always White). She laughed, relaxing. Her dad was home. Now her mom wouldn’t be mad anymore. Everything was all right, and it was okay that she’d had a birthday after all. She smiled sleepily. “But magic’s not real. Just in stories.” Her father’s face grew serious. There weren’t any foster families on the reservation who could take her, so she ended up getting shuffled around before landing with Ralph and Dina. That placement with Ralph and Dina is where this story takes place. There's a lot about emotional interactions Molly has with foster families and other children but almost nothing about emotions over her parents. She's snarky about her mom, but her dad is pretty much just... not in her head or heart. That, in short, is pretty much all that Kline tells us about Molly and her identity. 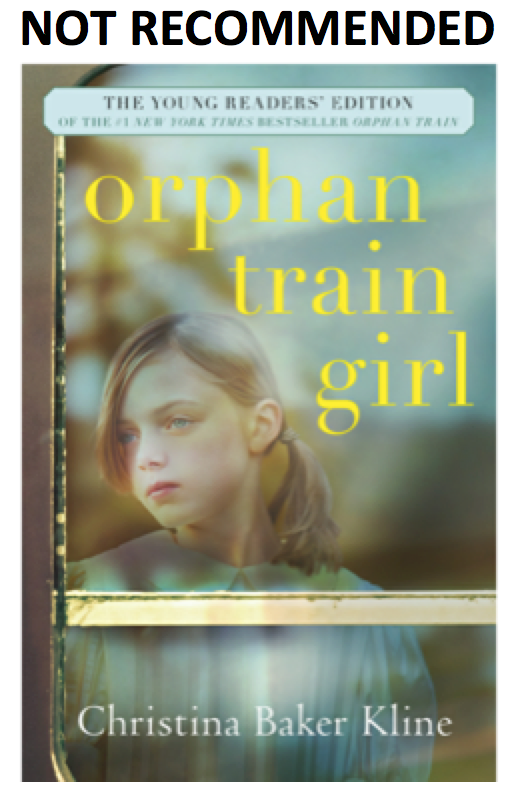 Orphan Train Girl is really about the girl who was, in fact, an orphan train girl. That girl, Vivian, is the other character in the story. The book description tells us that Vivian asks Molly about her life, but there's very little of Molly's life in comparison to what Vivian tells her about her own life. Molly’s identity and purpose for being in this story is to provide a way for Kline to tell a story about Vivian. …use the Indian concept of portaging to describe “their journeys along uncharted waters and what they chose to carry forward in portages to come.” The concept of portaging, I realized, was the missing strand I needed to weave my book together. And that, speaking frankly, is how a major publisher can turn a best seller into something that will bring in more money: adapt it for young readers and put it forth as if it is a Native story. It isn't. Orphan Train Girl is (if you can't tell), rubbing me the wrong way. In a case like Molly’s, when a Native American family is not available to foster a child, the Tribal Court will allow her to be fostered to a non-Indian family. ...advising me on issues related to the ICWA, and adding shading and nuance to some complicated questions about Native American symbols and laws. As I noted, though, there's no ICWA in the story. I assume the "symbols" has to do with those charms that Molly's dad gave to her. But all in all, the story that Kline tells is one where she's using a Native character and Native content to tell a story that is--at its heart--about a White woman. It is a history Kline clearly wants to tell but she could have done that without this decorative use of Molly. 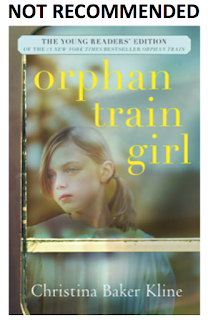 In short: I do not recommend Orphan Train Girl. Published in 2017 by Harper, this is another instance of a book written by a non-Native writer who is using Native content (poorly) and getting published by a major publisher. For the sake of every child in the US, this has to stop. "and she can understand, better than anyone else, the emotional binds that have been making Molly’s life so hard." makes me wonder why "better than anyone else" is here. Like, what does that mean? Why would Vivian understand Molly based on Vivian's history than, say, oh, so many other folks with marginalized identities who were separated from their parents and tossed into foster homes? This is insulting hyperbole on the part of the author, or if the author didn't write the description, whoever wrote it. Also *cringe* all I can think of at the end is, yes, great, another author who took on a sensitivity reader and didn't listen enough to their advice to incorporate any of it into their final draft. Yup, using Indians as decoration in order to market and sell (and win awards for) "diverse" (formerly "multicultural") children's books. I hope that Christina Baker Kline, and anyone who read the book, will watch the new (Nov 2018) documentary "Dawnland" to understand the issue of ICWA and Native American child removal in Maine. I liked this book the first time I read it but the way Kline overshadows Vivian over Molly, I didn't even remember that she was Indian....and I AM part Indian!I feel so different now. Yes she was MAJORLY out- characterized by Vivian, leaving nothing remarkable.